Thread of Life | Oh Sarah O ! Earlier this year I had the opportunity to crowd fund an art exhibition by Sharon Mossbeck called The Thread of Life. It's a contemporary art project using cross-stitch. 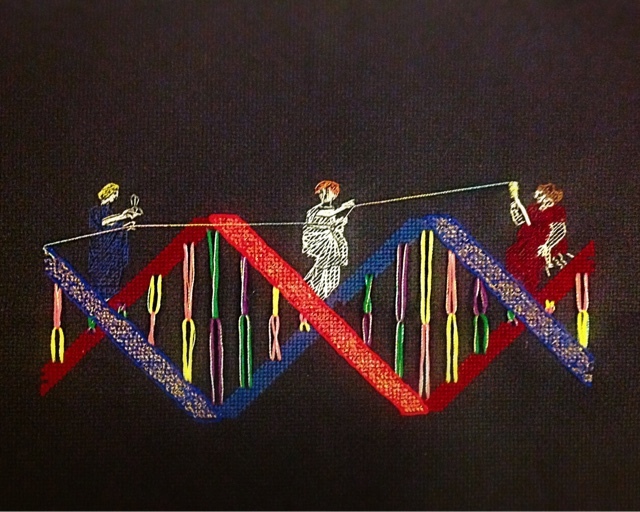 Part of the project had a participatory element in which people were asked to create their own cross-stitch based off of a pre-designed DNA pattern but you could use any materials or additions that you liked. I chose to stick with cross stitch and regular DMC thread on a black Aida cloth, but I added some embroidery techniques and created my own pattern for the Three Fates. 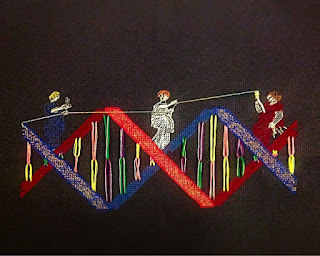 My idea was to connect the Fates to the DNA by using metallic thread illustrate how our DNA helps set the path for the course of our life. The exhibition is set to be held at Bank Street Arts in Sheffield, UK from November 1-30, 2015. The venue is open Wednesday to Saturday from 11am-4pm.